Fairmount Marine’s powerful tug Fairmount Glacier has successfully assisted in the installation of the floating production storage and offloading unit (FPSO) Usan, offshore Nigeria. For this operation Fairmount was contracted by Saipem Energies, which needed a 200 ton bollard pull tug for this job. FPSO Usan is one of the largest of its kind: 320 metres long and 61 metres wide. The unit is build by Hyundai Heavy Industries in Korea. The Usan oilfield is discovered about ten years ago. The field is situated 100 kilometres south of Port Harcourt, with water depths up to 850 metres. The tug Fairmount Glacier just has had a successful docking in Durban (South Africa) when it was contracted by Saipem Energies. During mobilization towards Nigeria, Fairmount Glacier called at Pointe Noir for preparation works. Directly hereafter the tug proceeded towards the Usan field, offshore Nigeria. On August 4th Fairmount Glacier connected to the FPSO Usan as requested by Saipem Energies. 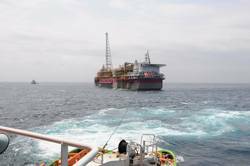 After almost nine weeks of continuous heading control and other general assistance to the Usan, the FPSO was successfully installed and Fairmount Glacier was ordered to commence demobilization. Fairmount Marine is a marine contractor for ocean towage and heavy lift transportation, headquartered in Rotterdam, the Netherlands. Fairmount’s fleet of tugs consists of five modern super tugs of 205 tons bollard pull each, especially designed for long distance towing.